Part 1: Who's Really Paying the Bills? This is the first in a three-part series covering some of the ongoing problems in our current health care system. There is no question that the Affordable Care Act (ACA) has opened the door for thousands of New Mexicans who are now able to purchase a private health insurance policy or have realized that they are eligible for Medicaid. Despite the doors it has opened, however, the ACA is still tied to a dysfunctional private insurance system. Recent stories in the press have once again exposed some of the ugly practices of the private insurance industry and the pharmaceutical industry. What's been laid bare thus far? Today's post focuses on the exorbitant rise in deductibles, which is dwarfing the rise in premiums. 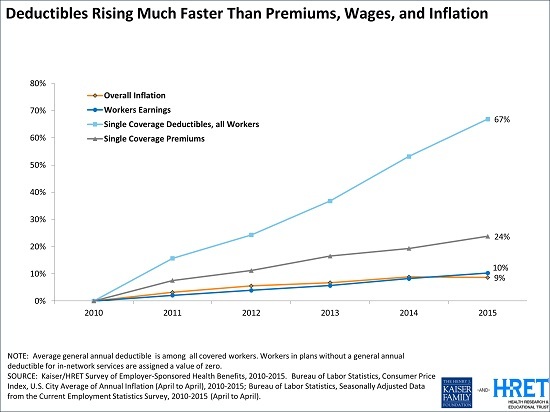 "Since 2010, deductibles for all workers have risen almost three times as fast as premiums and about seven times as fast as wages and inflation," states the Kaiser Family Foundation in a September 22 press release. The chart below shows a 67% increase in deductibles since 2010, compared to a 24% increase in premiums (single coverage). Both greatly outpace the increase in wages (10%) and the overall inflation rate (9%). The name of the game is to make consumers increasingly responsible for paying for health care, based on the theory that out-of-pocket obligations will force them to spend wisely. But that is not what is happening. The most recent Gallup poll on this topic discovered that one in three people had put off needed medical treatment because of cost. Gallup reports that this figure is "among the highest readings in the 14-year history of Gallup asking the question." Moreover, the percentage of those covered by private insurance who put off medical care because of cost increased from 25% in 2013 to 34% in 2014. "Consistent with recent research by The Commonwealth Fund, the growing use and size of deductibles in both employer and marketplace plans as a means to lower premiums threatens to undermine the gains Americans have made in coverage since 2014. . . . In an economy that is still struggling to deliver significant wage gains to working families, ever higher cost-sharing in health plans will further degrade their financial security." Large deductibles, co-pays, and co-insurance may help to slow premium increases, but who benefits? Postponing care due to cost obviously hurts the consumer, but not the insurance industry coffers. There are no deductibles under the Health Security Plan, and there are no copays for preventive care. This will enable people to get the care they need, when they need it. Since delays in accessing needed medical care often result in more serious--and more costly--medical issues, this approach should help to improve the overall health of New Mexico residents. Premiums for the Health Security Plan will be calculated based on the actual cost of medical care for the Plan's members, and premiums will be adjusted based on each member's income (with caps). After the Health Security Plan has been in operation for five years, the administrative portion is required to be no more than 5%, compared to 15%-20% for the private insurance industry. (The publicly administered Medicare system is somewhat less, at 3%.) This low administrative cost is primarily due to the simplification of an overly complex multi-payer system, which also impacts provider overhead. Next up, pharmaceutical price gouging . . .